After so much angst City Hall ended with our beloved mayor Shin Mirae and Assemblyman Jo Gook together without the bitchy Go Hae and meddling BB. Affected much? Yeah. I was really down this last few days because of the eps 17, 18 and 19. The ending was when Jo Gook proposed to Shin Mirae, with the implied marriage (mostly picture taking) and the campaign trail to Blue House. Blue House is Korean's White House (US) or Malacanang (Philippines). Finally a happy ending. I can sleep soundly today. I can't let this opp pass without mentioning Jo Gook's assistant, Ha Soo In or Lee Joon Hyuk in real life. 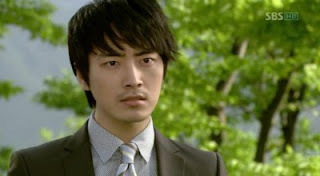 He's the prosecutor in City Hunter (after 2 years). I like both his character in City Hall and City Hunter but of course he much cuter on the first KDrama.